JVM HLN 5 minutes ago video of DB's former friend, from Ft. Bragg. "She (DB) can turn that cry on. She is a con artist." 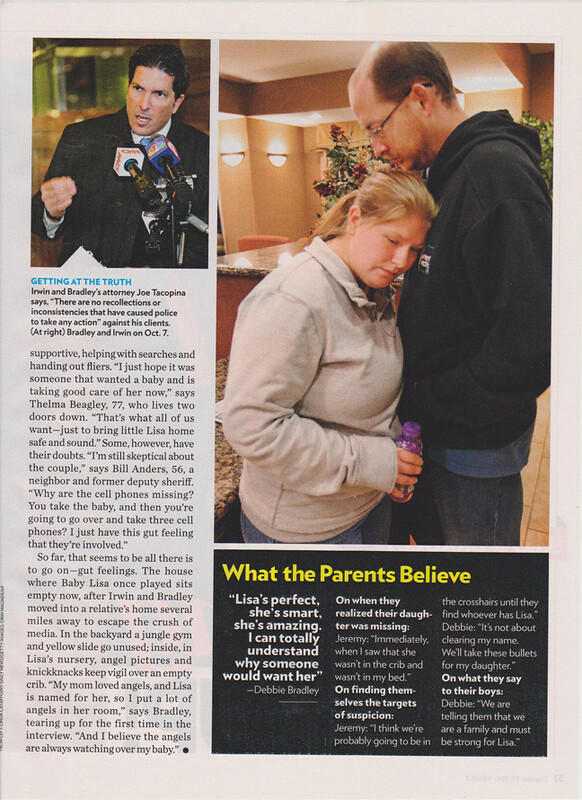 I don't know if anyoone has read the people magazine article but I was reading it today at work and it said that Jeremy left for work at 5:30 and that deborah cooked chicken dinner for herself ,the boys,the neighbor, and the neighbors daughter and then put Lisa down at 6:40 because she was fussy. Then she put in a movie for the boys and the neighbor girl and then her and the neighbor drank. Soooo....she was able to cook a chicken dinner , eat it , clean the kitchen spotless as seen in the video , and put lisa down and get her to sleep so that she could drink with the neihgbor ? That is all in an hour and 10 minutes ? wow! Anyone else get to read the article? I didnt , dang.......wonder if we can find it on line...Klaas has always been good about posting that kinda thing....me...not so much....I just learned how to post my own pictures..lol.....but yea...Id like to read that one myself!! It had a lot of details saying that she also bought mac and cheese when she got the baby food ,wine,and wipes. And if I am not mistaken this comes from her interview for this article. Any monkeys have the magazine? I should have tried to take a pic of the pages . thats really interesting.....Id like to read that ...maybe someone will find it and post it if not I will look for it tomorrow........do you think that what they usually post in that magazine can be believed? Not sure how credible the magazine is or Deborah if she gave the interview . just not become so involved and interested in yet another apparent travesty of justice against one more helpless and trusting young little person. But, there is something so intrinsically compelling about this precious little face of Baby Lisa that begs for help - begs for justice. What a precious little person ... she needed loving protection twenty four hours a day. No excuse for an inebriated caretaker/mother. I don't even buy that scenario anyway ... What on earth happened to this angel? In my view - the biological father is as peculiar as well. "What Happened to Baby Lisa?" is the title of the People magazine cover spread now on stands in stores. 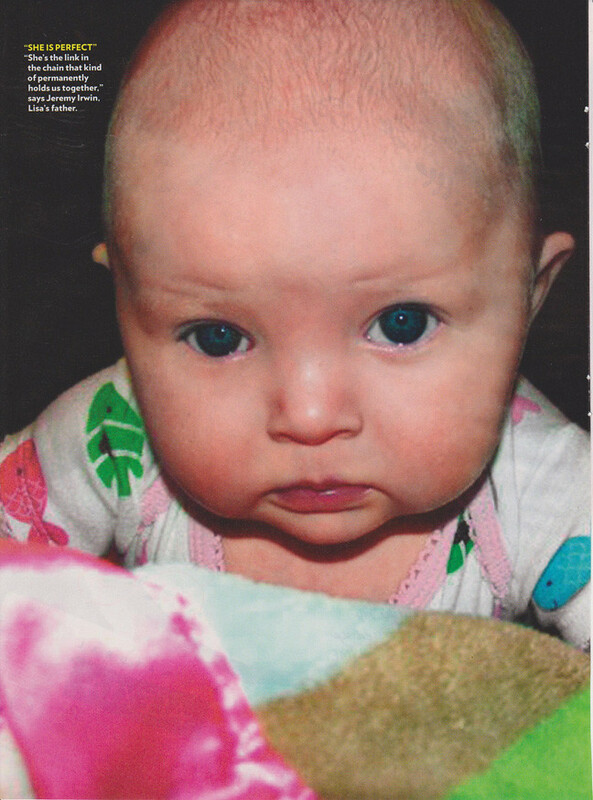 The Kansas City missing baby case has gone national and international, and now with the new edition of People, even more people are aware of Lisa's disappearance. 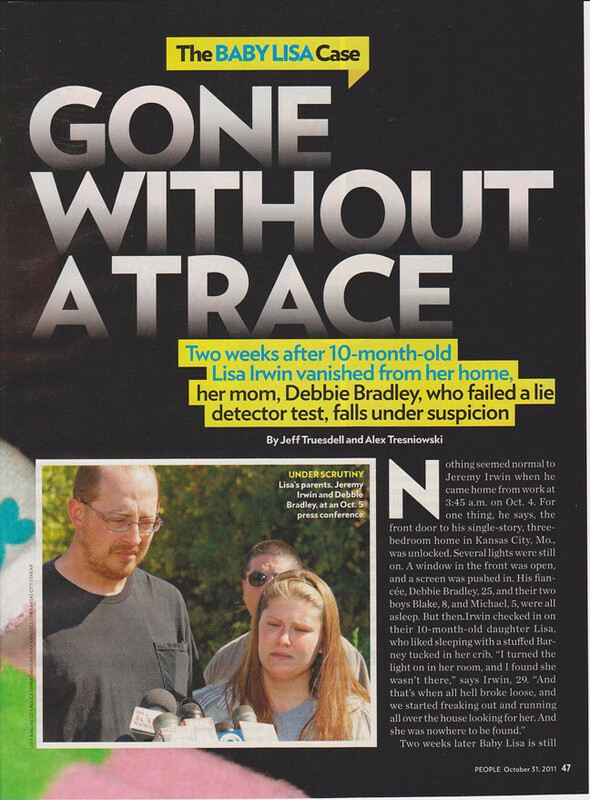 In the article, Deborah Bradley and Jeremy Irwin retell their version of the events they remember from Lisa's disappearance nearly three weeks ago and deny any knowledge of where their daughter is. 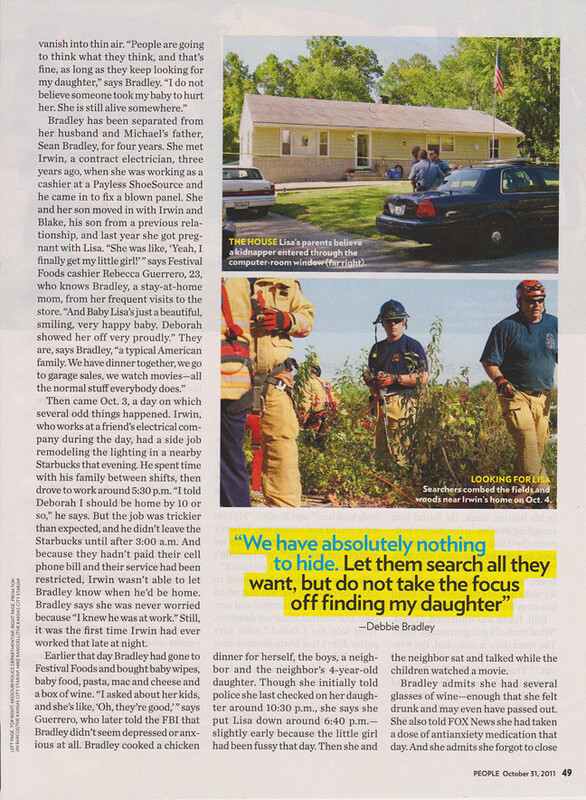 Bradley says, "Let them search all they want," about the recent intense search conducted at their home. Yes ! Yes ! Yes !!!! I love you !!! local video's driving from dumpster fire location to Irwin's house. Yep thats the one ! thanks Klaas ! 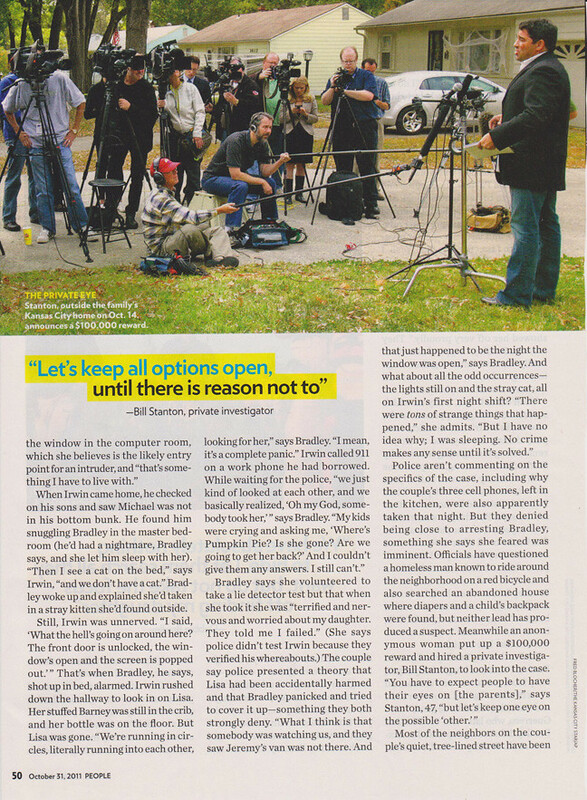 ok...I just read the entire thing and one thing that just stood out to me is the 911 call.....in this article Jeremy says when they noticed that the crib was empty and Lisa's bottle was on the floor they called 911 and everyone was running around crying and stuff...ok...but in the video of the 911 calls the first thing Jeremy says when he called 911 was that there had been a break in ......then after the dispatch called out that info, he then said that his 10 month old was also gone.................wth....reminds me of Misty Croslins 911 call........If my daughter was not in her crib when I walked in the room the first thing I would have done was call 911 and that would have been my first words...."my baby is gone"....not my house was broken into.......see...something just isnt right.............and also......did he call 911 on the house phone?......because all the cell phones were missing so how did he call 911 if they didnt have a house phone! Very good point .. and the recording of the dispatch to LE said he also said "he didn't witness anything"